WASHINGTON (A.A) - An anchorman of the U.S. TV station MSNBC and founder of the world's biggest online news program "The Young Turks", Cenk Uygur, said Wednesday that Turkey went through unbelievable and great changes in the last 20 years. Uygur participated in the Turkish-American National Leadership Conference that took place in U.S. capital of Washington last week. In an exclusive interview with the AA on Wednesday, Cenk Uygur said that giant shopping malls stood in Istanbul currently where he used to ride his bike as a child. The developments in Turkey are simply unbelievable. Turkey's economy is growing enermously. Turkey is one of the biggest 20 economies of the world and it continues to grow. Turkey seems to be the center of foreign investments in the world. I can not tell you how fascinating it is to see such a development in Turkey, Uygur said. In regard to Turkey's foreign policy, Uygur said that he had no criticisms of the Turkish foreign policy. I know that certain circles argue that Turkey has shifted its axis to the East. It is a place where Turkey has power and it looks at Turkey as a fair mediator, Uygur said. Turkey for a long time looked towards the West from an ideological perspective. I support such an ideology as an individual with Western perspective. However, in the West, the European Union (EU) constantly says 'No' to Turkey. The EU is in an economic mess presently and, perhaps, their rejection of Turkey is a good thing, Uygur underlined. In reference to Turkish-U.S. relations, Uygur said that the peoples of Turkey and the U.S. resembled each other. "That is why U.S. President Barack Obama described Turkish-U.S. relations as 'model partnership'," Uygur said. However, we have experienced certain problems in the past decade. It seems like the disappointment in Turkish people's minds stems from the fact that President Obama has not kept his promises. For example, Obama had stated that he would hold Israel responsible for the construction of settlements. Yet he has not fulfilled his promises, Uygur said. In the long term, Turkey and the U.S. will remain as great partners, Uygur said. Touching on American Turks, Uygur said that nowadays there were many American Turks who could be regarded as successful such as Dr. Mehmet Oz. This is a good development. Such success stories present a more positive image of Turks to the American society, Uygur said. Gone are the days when being a doctor, lawyer or engineer was impressive. American Turkish parents must encourage their children to become artists, writers, showmen and politicians. These are careers with great impact. Unless you have individuals working in such fields, it is not possible to be influential in the U.S., Uygur said. Cenk Uygur (born March 21, 1970) is an American Turkish radio talk show host and political commentator on the MSNBC cable television channel. 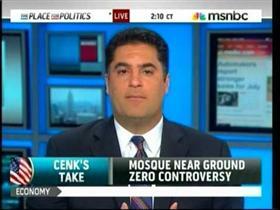 He is the main host and co-founder of the liberal talk radio show 'The Young Turks'. Uygur was born in Istanbul, Turkey. He and his family emigrated to the United States when he was eight years old. Uygur grew up in East Brunswick Township, New Jersey, where he graduated from East Brunswick High School. He later graduated from the Wharton School of the University of Pennsylvania and Columbia Law School, and is a former associate at the law firms of Drinker Biddle and Reath in Washington and Hayes and Liebman in New York City.